Black cats have always been one of my favorite symbols of Halloween. It’s not a mystery why. We’ve got our own fuzzy black cat that calls our house her home. She’s not a bit spooky or scary. In fact, she’s often silly and sweet. 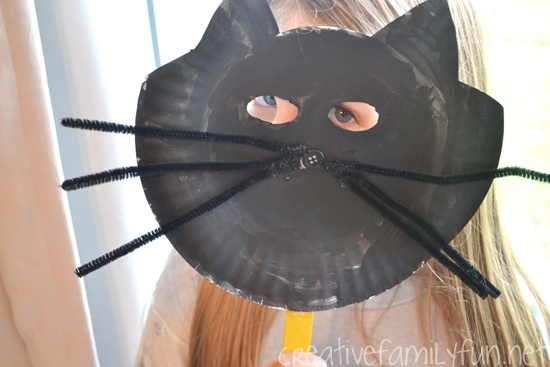 Black cats are a lot fun for kids who don’t like all the scarier parts of Halloween. 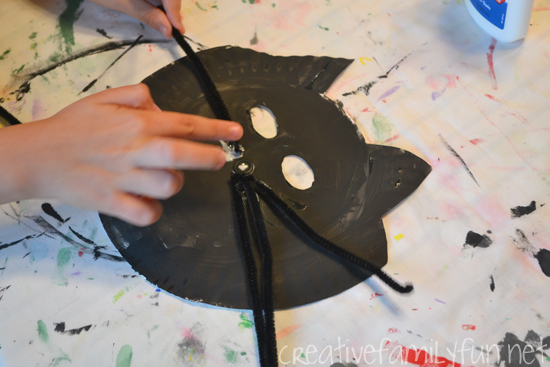 This black cat mask is a fun Halloween craft for your preschool and elementary kids. 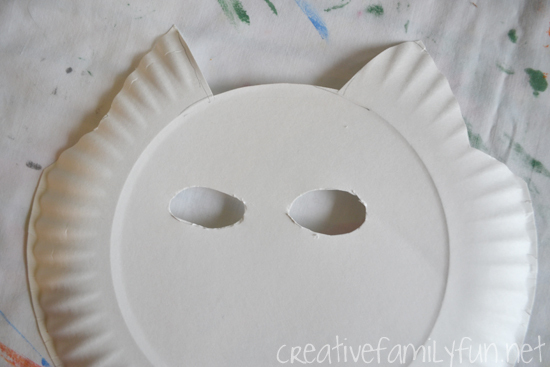 Draw a couple of simple pointy ears at the top of your paper plate and cut along your lines. Also, cut two eye holes so you can see out of your mask. I’ve found that it’s a lot easier to do any cutting before painting the mask. Also, depending on the ages of the kids doing this project, an adult may need to do the cutting before sitting down to make this craft. 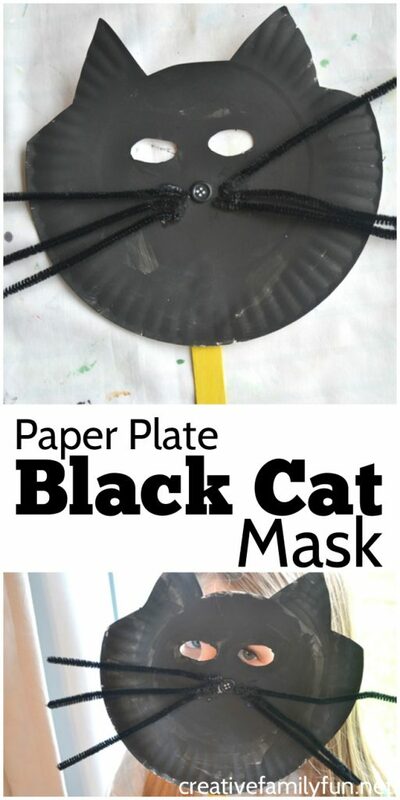 Once you’ve created your cat shape, use the black paint to paint the front of the mask. The front of the mask is actually the bottom of the plate. You’ll want the plate to curve inwards toward your face. After the paint is dry, or almost dry, glue on a button for the nose. Cut three pipe cleaners in half for your whiskers. Glue all six whiskers next to the nose, three on each side. Letting the glue dry under the pipe cleaners is by far the hardest part of the mask. 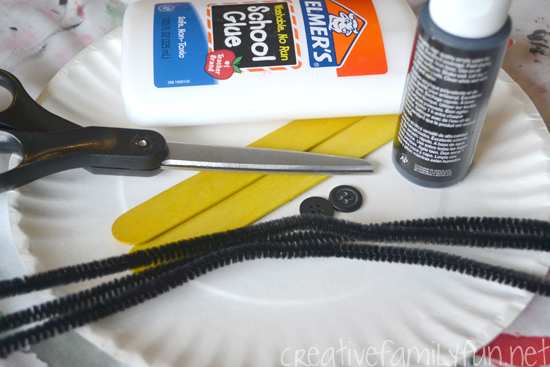 If you pick up the mask or move it around too much, the pipe cleaners will fall off while the glue is still wet. The best thing to do is to just walk away for awhile! If you need a quicker drying time, consider using a low-heat hot glue gun to attach the nose and whiskers. Once your glue is dry enough to move the mask around, glue a craft stick to the bottom of the mask so you can hold it up to your face. Let it dry for a bit and soon your mask will be done. 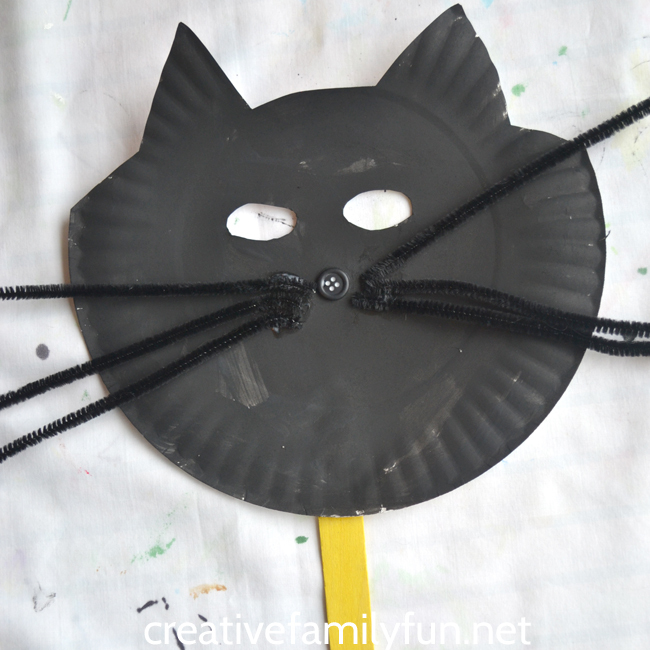 This Black Cat Mask is a little bit spooky, a little bit silly, not one bit scary, and very sweet. 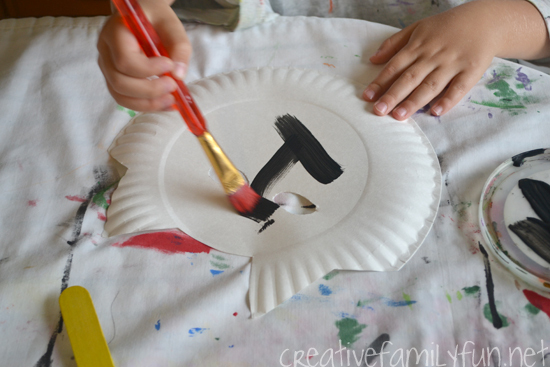 Your kids will love making one and playing with it later.